I mentioned in my last post that I had a small amount of honey ice cream left over after a recent class. In the class the honey ice cream had been prepared to accompany a Plum Galette. I over-purchased a bit on the plums, so in addition to the ice cream I brought home a few extra plums. If this had been almost any other fruit, I would have just eaten it...I love fresh fruit. But I'm not crazy about fresh plums. I wrote about this at some length when I posted a recipe for Plum Sorbet a few years ago, so I won't belabor it here. As I pointed out then, while I may not enjoy plums raw, I love them when they have been cooked in some way...baked, roasted, poached, etc. Since I hate to waste food and I didn't have enough to make a pie...or a crisp....I began looking for a way to cook these few remaining plums before they were past their prime. 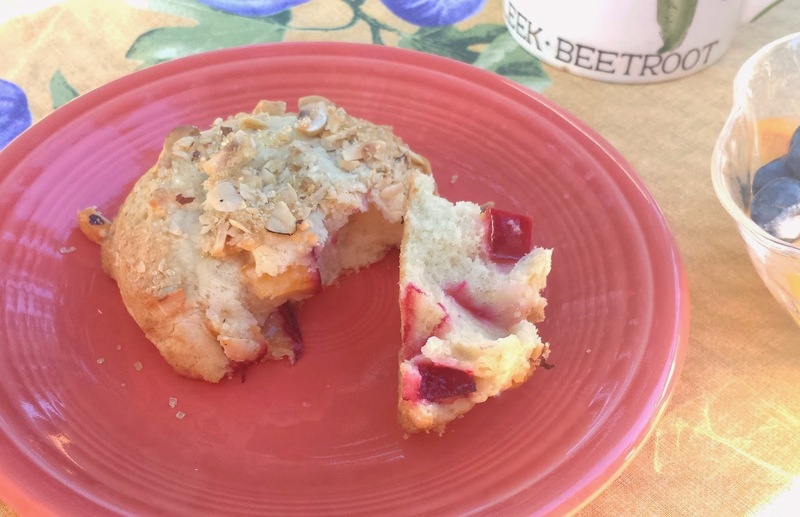 Two of the plums made their way into a variation of the Sweet Cherry and Almond Scones I posted earlier this month. Since these scones were also delicious when made with apricots (paired with pistachios), I mentioned on my Facebook page that I had probably misnamed them. I should have called them Summer Stone Fruit Scones. If you want to give the plum version a try, just substitute a couple of plums (about 6 oz. )—halved, pitted and cut into 1/2-inch pieces—for the cherries, a teaspoon of vanilla for the almond extract and hazelnuts (very lightly toasted, skinned and chopped—you'll need about 3 oz. to get 2/3 cup) for the almonds. After making the scones, I still had a couple of plums left. As I was thinking about what to do with them I remembered a summer dessert I prepared for a client several years ago—individual plum upside down cakes. They were delicious—I'm not quite sure why I have waited so long to make them again. Since each little cake only uses half a plum, you can make a small batch of them even if you only have two or three plums. and top with a thick, even layer of brown sugar. The butter and sugar combine with the plum juices as the cakes bake, forming that traditional, gooey and delicious upside down cake topping. To make these plum upside down cakes look their best, it's important to remember as you arrange the fruit that you are looking at the back/wrong side of the topping. 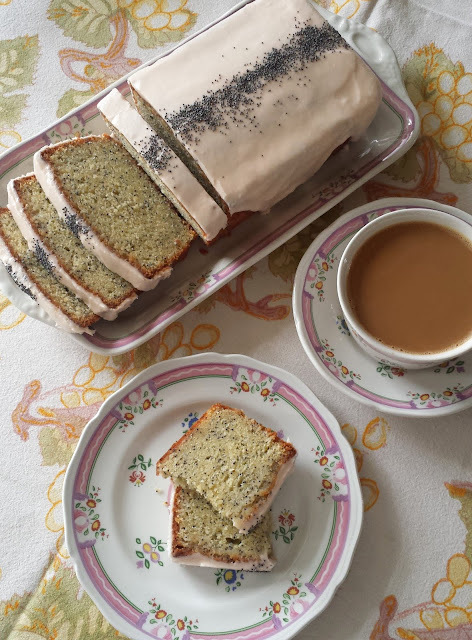 When you invert the cake you will want to see the ribbon-like arcs of the skin—not the interior of the plum that was next to the pit—uniformly fanned on top of the cakes. The best way to teach yourself how to arrange the plums so you will get this result is to simply fan a thinly sliced plum half (you may not need all of one half for each cake) on your work surface in such a way that it looks the way you want it to when it is on top of the cake. Then, take a wide spatula, carefully slide it underneath the fanned plum and turn it over. What you see at that point is what you should recreate in the bottom of each ramekin. I really like these cakes. As I noted in my Pineapple Upside Down Cake post earlier this year, a good candidate for an upside down cake needs to be slightly dense...with a tender, yet firm texture...in order to stand up to the substance of the fruit on top. This cake fills the bill perfectly. The cake also has a mild tang from the presence of brown sugar and yogurt that is delicious with the plums. All in all, these little cakes turned out to be just the thing for using up those last few plums. But...they are so good that it would certainly be worth making a run to the store to purchase a few more plums. To prepare the ramekins: Butter five or six 6-oz ramekins (see note). Use a half tablespoon (7 grams) of butter per ramekin and concentrate on getting most of the butter onto the bottom of each dish...the sides only need a thin film. Add a tablespoon of brown sugar (12 grams) to each and spread out into an even layer. Halve and pit the plums and slice thinly. Shingle the plums in on top of the brown sugar, arranging them so that the attractive side will be on top when the cakes are turned out. You will need about half a plum for each pan (maybe a little less), depending on the size of the plums. Set aside. Combine the flour, salt and baking powder in a small bowl and set aside. Cream the butter and sugars until light and fluffy. Beat in the egg. Beat in the vanilla. Fold in half of the flour mixture, followed by the yogurt, followed by the remaining dry ingredients. Using an ice cream scoop, divide the batter among the prepared ramekins. Spread the batter evenly. Place the ramekins on a baking sheet and transfer to a 350°. Bake until golden and a toothpick inserted in the center comes out clean—25 to 30 minutes. Serve warm. Serves 5 or 6. You may make five or six cakes. If you like a higher portion of cake to fruit, make five cakes. You will only need 2 1/2 T. of butter and 5 T. of brown sugar for the topping. I prefer to make 6 cakes. The recipe is easily doubled to make 10 to 12 cakes.